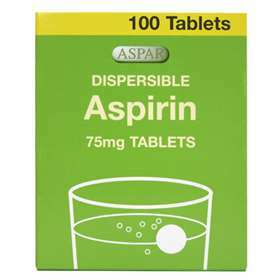 Dispersible Aspirin Tablets 75mg (100) help to prevent heart attacks and strokes in people who have previously suffered from these conditions. It is also for those who have under-gone by-pass surgery. These tablets have to be dispersed in water before taken by mouth. Each tablet contains Aspirin 75mg. Also contains lactose and sodium. The usual dose, for long term use, is 1 or 2 Aspirin tablets once a day. Up to 4 Aspirin tablets a day can be taken under the instruction of your doctor. Always seek medical advice first, before using Aspirin. Do not take if allergic to aspirin or ibuprofen. Do not take if you suffer from asthma, have a stomach ulcer, a history of stomach ulcers or indigestion, or are taking blood thinning drugs. Do not take if you are breast feeding. If you are pregnant, please talk to your doctor first. Do not give to children under the age of 16 years. Due to pharmacy regulations, we are only able to supply one packet of Numark Dispersible Aspirin per order, per month.